Flint, Mich. – The Flint Firebirds Hockey Club selected 15 players in the 2019 OHL Priority Selection presented by Real Canadian Superstore held Saturday, Apr. 6. Of the 15 new faces added to the Firebirds’ organization, 10 were forwards and 5 were defenseman. 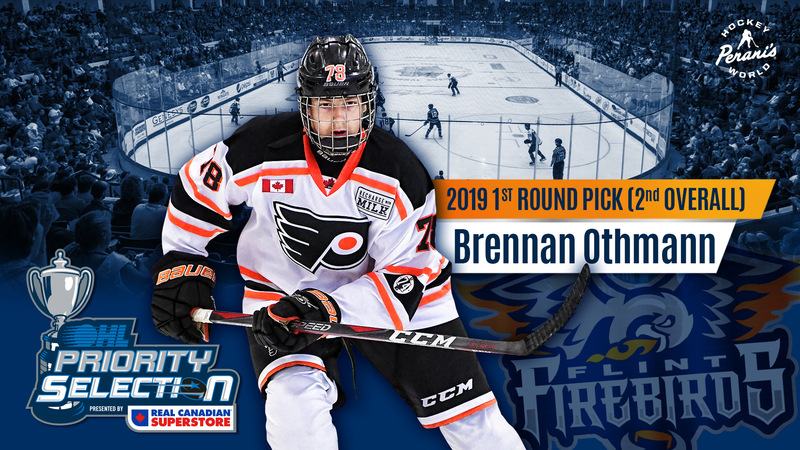 The Firebirds selected forward Brennan Othmann (pronounced awth-min) as the second-overall pick in the first-round of the 2019 OHL Priority Selection. Othmann, a native of Pickering, Ont., recorded an impressive 146 points (66G, 80A) in 72 regular season games with the Don Mills Flyers Minor Midget AAA hockey team this year. He played an integral role in helping the Flyers to a 77-0-6-1 record, capturing both the Greater Toronto Hockey League’s (GTHL) regular season and playoff titles. Othmann led Don Mills in playoffs with 22 points (7G, 14A) in 13 games and was also selected to represent Team Ontario at the renowned 2019 Canada Winter Games, leading his team with 16 points (10G, 6A) in six games to secure a Silver Medal. 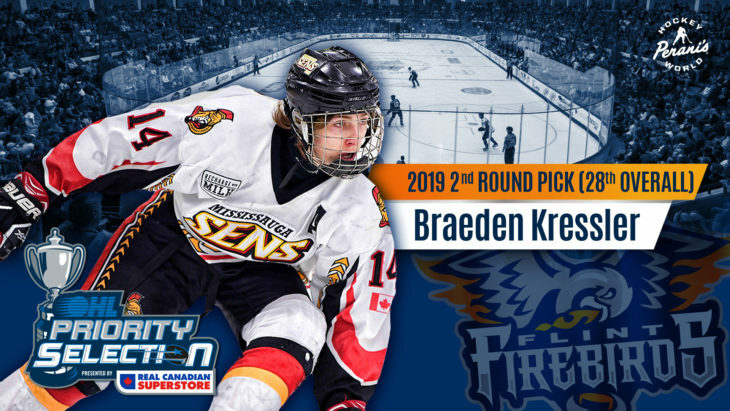 Flint then selected Braeden Kressler in the second-round, 22nd-overall. The Kitchener, Ont. native played his youth hockey for the Mississauga Senators AAA hockey team in the Greater Toronto Hockey League (GTHL). A five-foot-eight, 148-pound center, Kressler recorded 30 points (12G, 18A) with the Senators and also notched two goals in just three Tier-II ‘Junior A’ games with the Burlington Cougars in Ontario Junior Hockey League (OJHL). Kressler also finished second-overall in both the on-ice and off-ice testing at the 2019 OHL Combine. In the third round, the Firebirds tabbed Sault Ste. Marie, Mich. native and defenseman Tyler Dunbar 44th-overall. One of five American’s selected by Flint this year, Dunbar tallied 16 points (4G, 12A) in 23 games with the Soo Thunderbirds AAA hockey team in the Great North Midget League (GNML). Dunbar answered the call to ‘play-up’ with the Soo Thunderbirds Midget Major team for seven games and recorded one assist. Dunbar is 5-foot-11 and 171-pounds and tallied an assist in two Tier-II ‘Junior A’ regular season games and five playoff games with the Northern Ontario Junior Hockey League’s (NOJHL) Soo Thunderbirds. Last July, Dunbar recorded three points (2G, 1A) in four games at the 2018 USA Hockey Boys Select 15 Player Development Camp in Buffalo, New York. 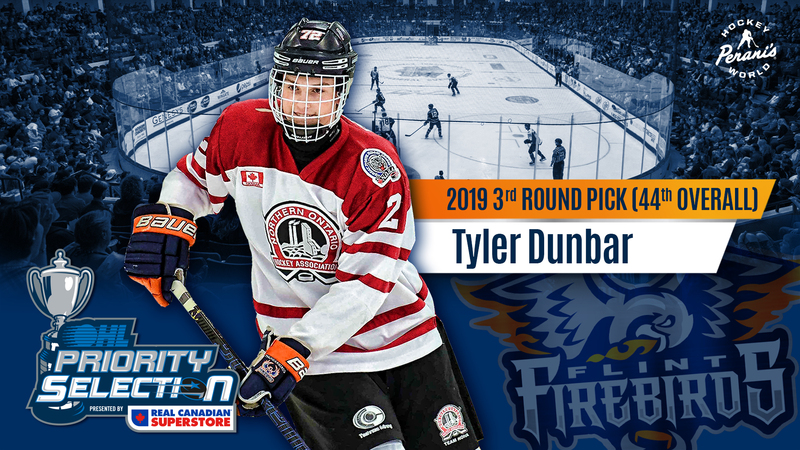 With being selected in the third round, Dunbar has become the highest-ever player to be drafted into the OHL from Michigan’s upper peninsula and the American side of Sault Ste. Marie. 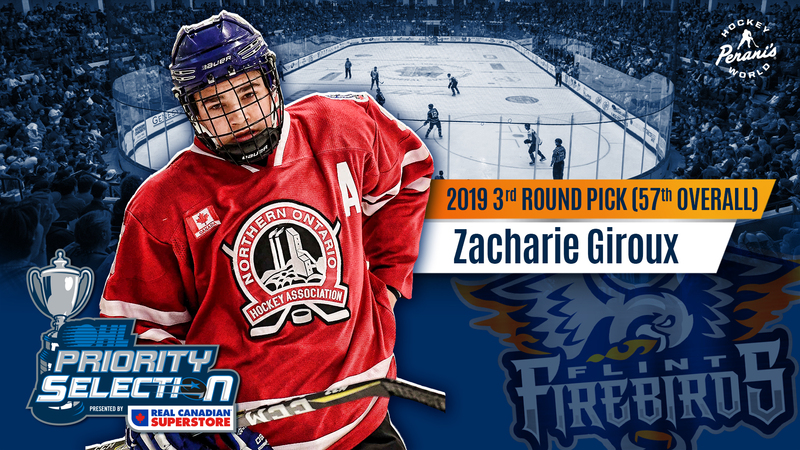 The Firebirds picked Zacharie Giroux (pronounced jer-roo) in the fourth round (57th overall). Giroux was named captain and led his team in scoring, averaging a goal-per-game and two points-per-game this year, recording 55 points (28G, 27A) in 24 games with the Sudbury Wolves AAA hockey team in the Great North Midget League (GNML). Also this year, the 5-foot-4, 135-pound centerman was awarded the 2018-19 GNML Most Gentlemanly Player. He then notched 10 points (7G, 3A) in seven playoff games with the Sudbury Nickel Capital Wolves AAA hockey team also in the GNML. 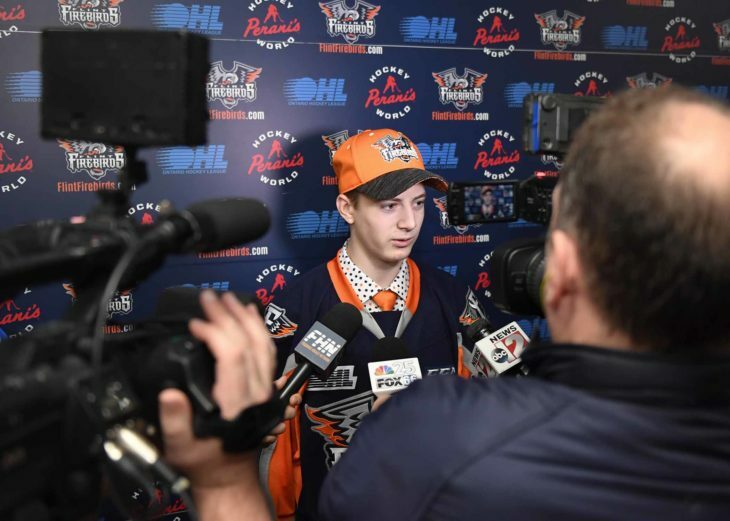 At the 2019 OHL Cup, Giroux earned a point-per-game (1G, 2A) in three contests with Team Northern Ontario Hockey Association. Giroux is a native of Sudbury, Ont. and his older brother currently plays for the Flint Firebirds’ in-state rival, Saginaw Spirit. 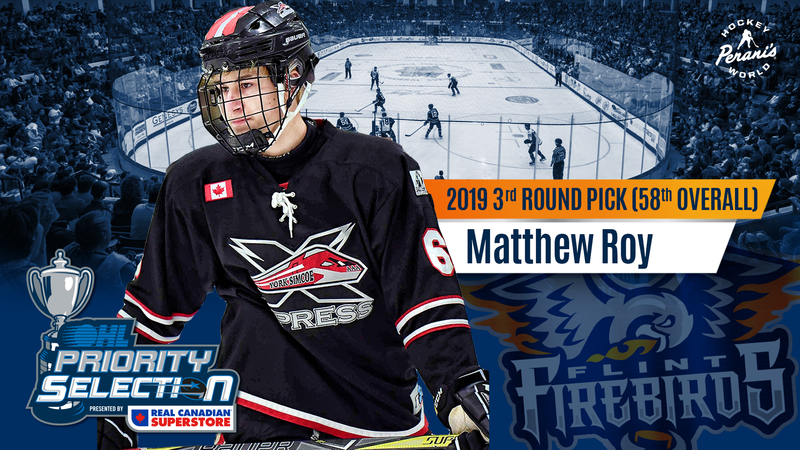 The Firebirds then selected Matthew Roy in the third-round (58th overall). 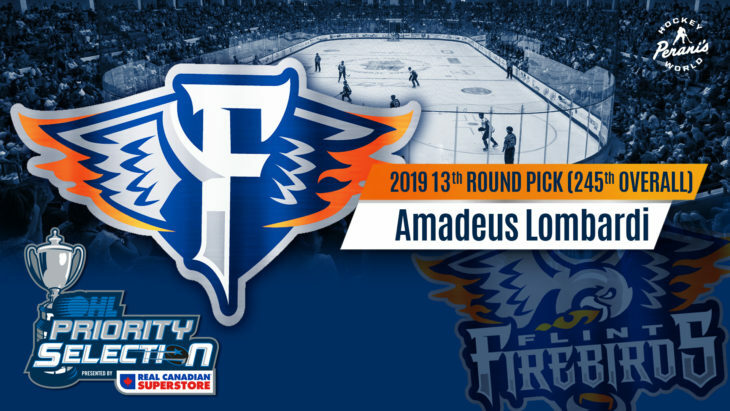 Roy was the first defenseman selected by Flint in 2019. A 6-foot, 166-pound right-handed shot, Roy, hails from Ottawa Ont., and notched 13 points (5G, 7A) in 34 games with the York Simcoe Express AAA hockey team in Ontario Minor Hockey Association Eastern Toronto Area (OMHA-ETA). He attended and played for university-prepatory school at St. Andrew’s College in Aurora, Ontario. Prior to playing for the Express, he tallied 21 points (3G, 18A) in 30 games with the Ottawa Valley Titans Bantam Major AAA hockey team in Hockey Eastern Ontario (HEO). 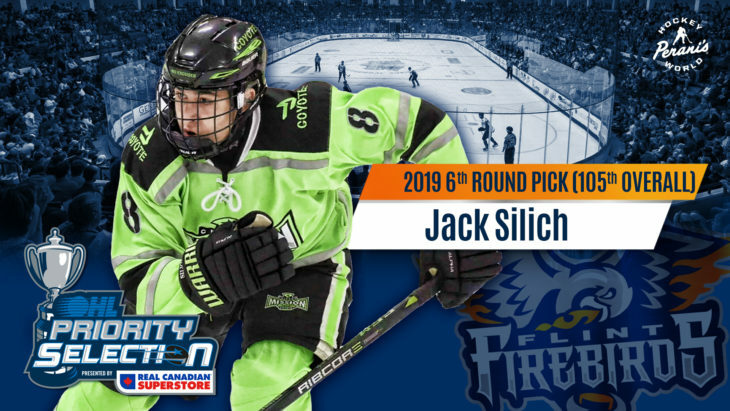 Jack Sillch (pronounced sil-itch) was selected in the sixth-round (105th overall). A native of Long Grove, Ill., Silich was the ‘goals-for’ leader after tallying 30 points (15G, 15A) in 20 games with the Chicago Mission AAA Hockey Team in the High Performance Hockey League (HPHL) en-route to capturing the HPHL title following a near-perfect 19-0-0-1 record this season. Like Dunbar, Silich also competed in the 2018 USA Hockey Boys Select 15 Player Development Camp in Buffalo, recording a point-per-game, posting four points (2G, 2A) in four games played. 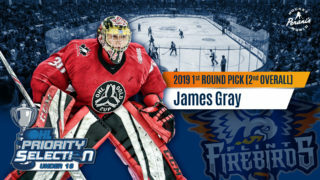 Clarkston, Mich. native Ty Gallagher (pronounced gah-luh-ger) was selected a seventh-round pick (125th overall) by Flint. A right-defenseman, Gallgher recorded 12 points (2G, 10A) in 19 games as an assistant captain with the Detroit Compuware AAA hockey team in the High Performance Hockey League (HPHL) this year. 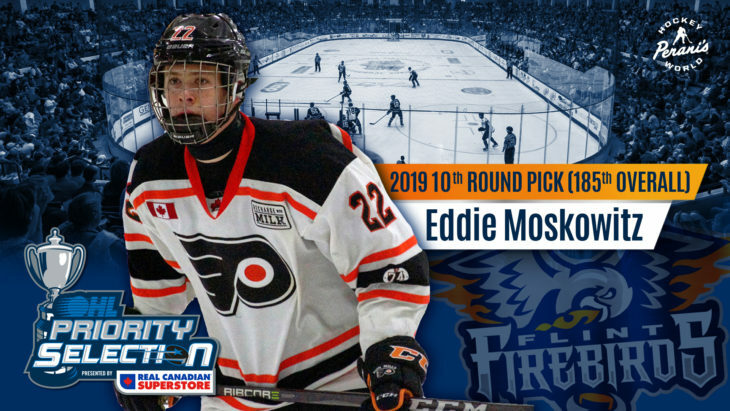 Last season, he notched 22 points (6G, 16A) in 20 games with the Compuware Bantam Major hockey team en-route to winning the 14U AAA National Championship in 2018. He was one of the few to win the prestigious Quebec International Pee-Wee Hockey Tournament with the Belle Tire AAA hockey team in 2016. Holly, Mich. native Jack Stolicker (pronounced stah-lick-er) is the second-closet local-area player to be drafted by the Flint Firebirds after Jacob Badal (Flushing, 2018). 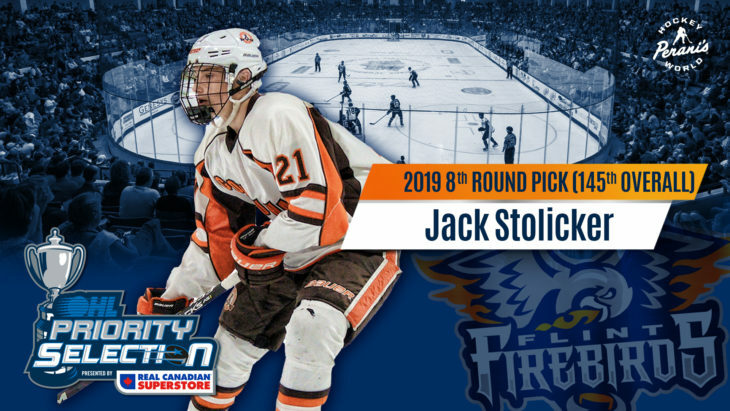 Stolicker was picked in the eighth-round (145th overall) by Flint after earning the International Silver Stick championship and the High Performance Hockey League (HPHL) championship with the U16 Detroit Compuware AAA hockey team this season. He also claimed the Tier 1 Elite Hockey League (TIEHL) U14 championship with the Detroit Victory Honda AAA hockey team. Most recently, Stolicker Finished third in both on-ice and off-ice testing at the 2019 OHL Combine. The Stolicker’s also become the first host family to have a son selected in the OHL Draft by the Firebirds as they billet current Firebirds’ Marcus Gretz, Ethan Keppen and Cody Morgan. 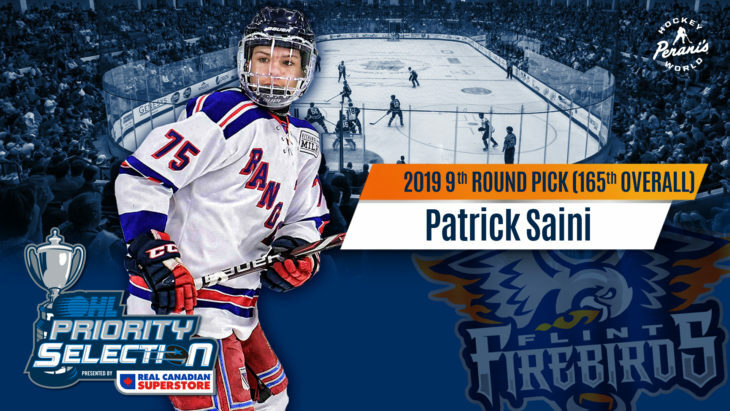 Flint selected Patrick Saini in the ninth-round (165th overall). The Toronto, Ont. native was a center for the past two seasons with the North York Rangers AAA hockey team in the GTHL. In both years, he led North York in points, recording 80 points (42G, 38A) in 67 games last season after tallying 104 points (66G, 38A) in 73 games the season before. The 5-foot-8, 170-pound skater was also led the Rangers in points at the OHL Cup, recording 4 points (3G, 1A) in 4 games. The Firebirds tabbed Eddie Moskowitz (pronounced ma-ska-witz) in the 10th-round (185th overall). Moskowitz has spent the last five seasons playing with the Don Mills Flyers AAA hockey team. He played a key role in helping Don Mills win the GTHL championship for the past four consecutive years. Moskowitz is a 5-foot-8, 170-pounds left-winger that hails from Toronto, Ont. He finished this past season with 74 points (34G, 40A) in 73 games. He finished in the top-10 in scoring en-route to capturing the 2019 OHL Cup after securing 10 points (5G, 5A) in seven games. 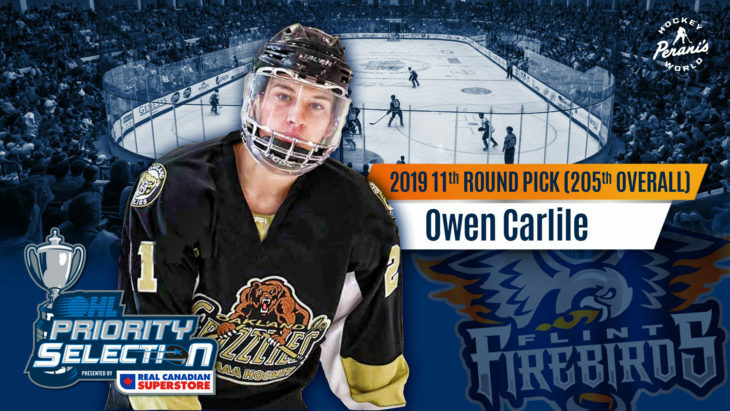 Brighton, Mich. native Owen Carlile (pronounced car-lie-el) was selected in the 11th-round (205th overall). Carlile has spent the last three seasons playing AAA hockey in the Detroit-area. After playing with the Detroit Honeybaked AAA hockey team for two seasons, Carlile suited up for the Oakland Jr. Grizzlies in the High Performance Hockey League (HPHL) this season. He earned 53 points (11G, 42A) in 63 games with the Grizzlies. The 5-foot-10, 160-pound centerman recorded more than a point-per-game average at the USA Hockey Tier I 15-Only National Championship last week, tallying seven points (1G, 6A) in six games before falling in the National Championship game. Of note, the first organized hockey Owen played was for the Flint Icelanders at the Firebirds’ current practice facility, Iceland Arena. 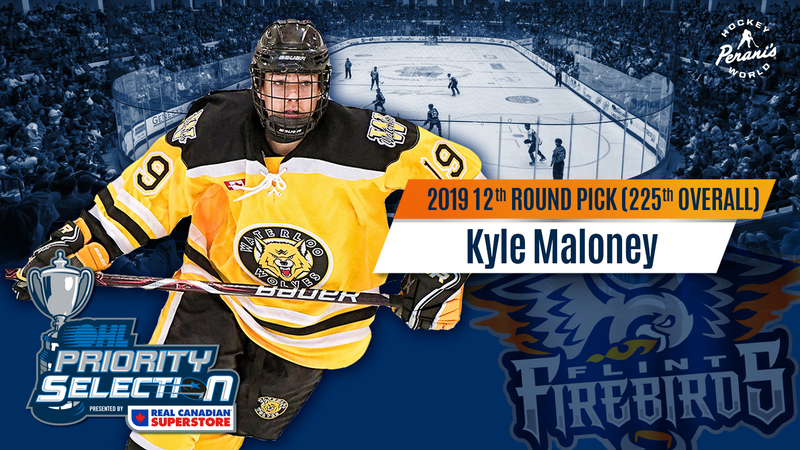 Kyle Maloney was selected by the Firebirds in the 12th-round (225th overall). Maloney notched 43 points (17G, 26A) in 33 games, including 11 points (7G, 4A) in 12 playoff games, with the Waterloo Wolves AAA hockey team in the Minor Hockey Alliance of Ontario (MHAO). Maloney played an integral role in capturing the MHAO championship in 2017 and 2018 and was selected to the MHAO All-Star team this season. The 5-foot-11, 137-pound center was selected to play in the World Selects Invitational in Italy with the East Coast Selects (Team Ontario) in 2015, where he recorded four points (2G, 2A) in seven games. Flint tabbed Amadeus Lombardi (pronounced om-ah-day-is) in the 13th-round (245th overall). A native of Concord, Ont., Lombardi led the Toronto Titans AAA hockey team (GTHL) with 48 points (19G, 29A) in 58 games. 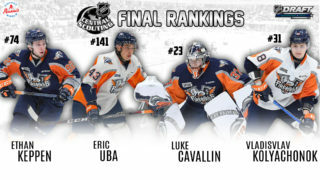 The 5-foot-8, 134-pound center has spent the last eight seasons playing AAA hockey and was the first player since the Edmonton Oilers’ Connor McDavid to ‘play a year up’ during his novice season with the York Simcoe Express AAA hockey team. 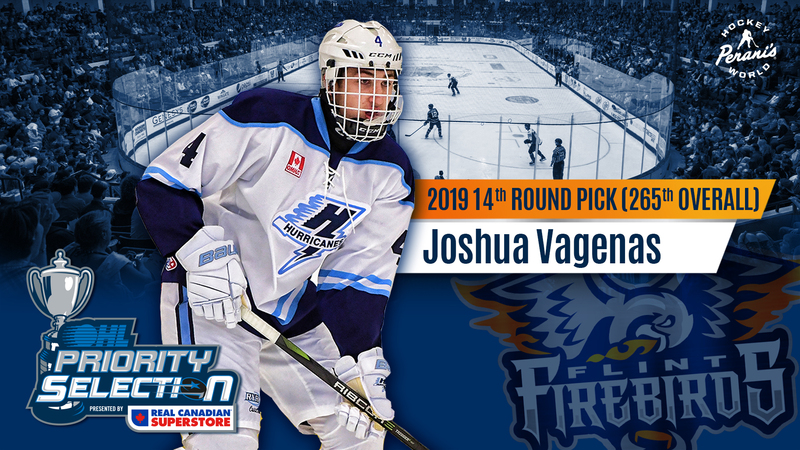 Joshua Vagenas (pronounced vuh-geen-is) was picked in the 14th-round (265th overall). Vagenas is a 6-foot-3, 185-pound right defenseman. He has been the leading scorer amongst defenseman for five of the last seven years that he has played with the Halton Hills Hurricanes (OMHA-SCTA). The Erin, Ont. native tallied 15 points (3G, 12A) in 43 games with the Hurricanes this year and captured the 2018-19 OMHA-SCTA league championship this year. In tournament play, Vagenas earned one points in five games at the 2019 OHL Cup and was selected to play in the World Selects Invitational in Italy with the East Coast Selects (Team Ontario) in 2015, earning three points in seven games. 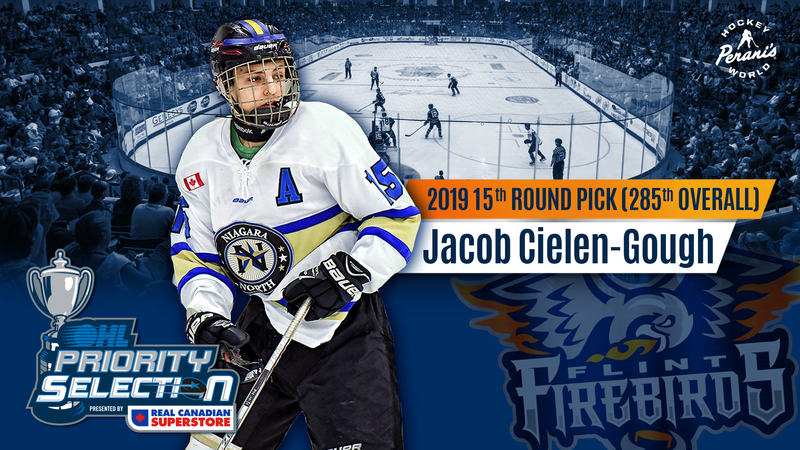 Flint then selected Jacob Cielen-Gough (pronounced chel-in gof) in the 15th-round (285th overall). Cielen-Gough, a native of St. Catharines, Ont., was the captain of the Niagara North AAA hockey team (OMHA-SCTA) and was the team leader in points among defenseman earning 20 points (5G, 15A) in 32 games. Cielen-Gough is a 5-foot-9, 141-pound right-shot defenseman and also posted six points (3G, 3A) in 15 playoff games helping Niagara North finish second in the SCTA.